Ales Razanau (1947), Belarusian: Алесь Разанаў. Razanau is one of the most important poets in contemporary Belarus, known also as a translator of the world literature to Belarusian. In his creative poetry writing, he experiments with the form and the content to a large extent. His poems are marked by an extensive use of allegory, their complex figurative structures and philosophical meditation. 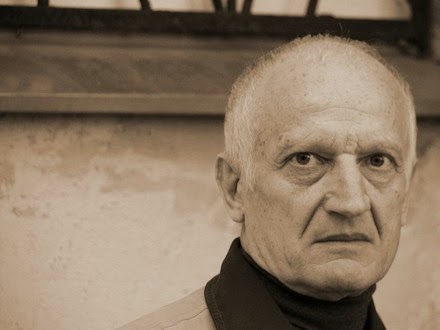 In 2012, Razanau was rewarded for the publication of his "dotty" poems titled "That Much and This Much" (Столькі і Гэтулькі) and received the "Zalaty Apostraf" prize by the "Dziejaslou" journal. The Razanau’s poems are also translated to Russian and Polish. In 2003, a collection of his poems in German titled "Wordtdichte" was published in Austria. Two poems presented by the author. I found some poems of this great poet. Really worth listening! Jeho práce sú preložené do viac ako 20 jazykov, samostatné vydanie knihy vyšli v Gruzínsku, Nemecku, Bulharsku, Poľsku. A. Ryazanov predstavil svoju nemecky písanú knihu «Месяц думае, Сонца разважае».Na tejto stránke nájdete aj rozhovor s ním.